Messengers in Regency costume on roller skates accompanied by a harpsichord-esque version of Richard Marx’s Right Here Waiting, are the early indicators that we are in a distinctly transformed version of Jane Austen’s classic, Sense and Sensibility, published in 1811. This wildly popular version by New York playwright Kate Hamill has won multiple American awards and, undertaken by The State Theatre Company ensemble, adds much comedy to the novel, known as one of the greats of the romance genre. This is an ambitious undertaking by the troupe, directed by Geordie Brookman. 29 characters are spread between nine skilled actors, and it very nearly goes off without a hitch. Lightning costume, accent and scene changes present challenges to both cast and audience; initially, we try to keep up, but relinquish the reigns as the laughter starts to flow in earnest. Anna Steen as Elinor Dashwood and Miranda Daughtry as her younger sister Marianne are the anchors of this tale. 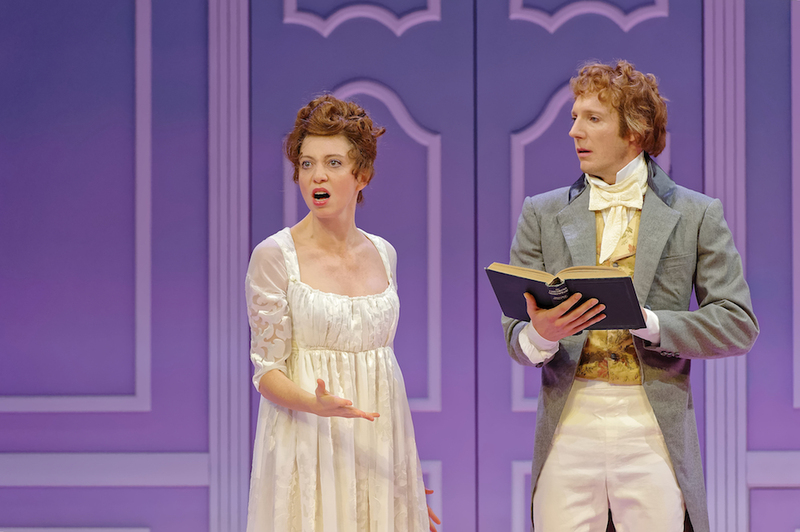 Daughtry’s rosebud complexion matches perfectly with her enthusiasm as the young matchmaker. Steen plays the wiser, protective sister with an authoritative air while the burden of their predicament looms overhead. The pair are convincing as they contemplate the price of love, overseen ably by Caroline Mignone as their mother. Rachel Burke’s character Margaret is not as persuasive. Precocious and bratty without the insistent inquisitiveness and fierce imagination of the originally drawn youngest Dashwood, the sisters grate when in unison, and revelations fail to have the delicious ‘ta-da’ so well set up by the storyline. The mercurial Nathan O’Keefe is delightfully magnetic in his numerous roles. He puts the ham in Hamlet as the timorous Edward Farras, and as Robert Farras with splendid comb-over, he puts the Austen in ostentatious, with his mumbled version of the Clash’s Should I Stay or Should I Go Now?. Aided ably by Dale March and Rashidi Edward, the trio of steely-eyed-dogs scene is one of the best. Lizzy Falkland gives equally exceptional performances as the diabolical Fanny and Mrs Jennings, complemented by the warmth of Geoff Revell as Sir John Middleton. Drawing from several musical eras, the end result is a work that somehow seems to lack its own identity, and some of the musical interludes jar, but are made up for by the ingenious and frequent hilarity of tunes at the change of scene. The fight scene, whilst technically well executed, is unnecessarily distressing. If its violence is meant to be a theatrical tool, the payoff is completely lost on us. Slapstick, by all means (this is a Rom-Com) but the fight’s very particular construction, in an adaptation that has been described as having a “feminist edge” and that the playwright intended to pass the Bechdel test, is bewildering. 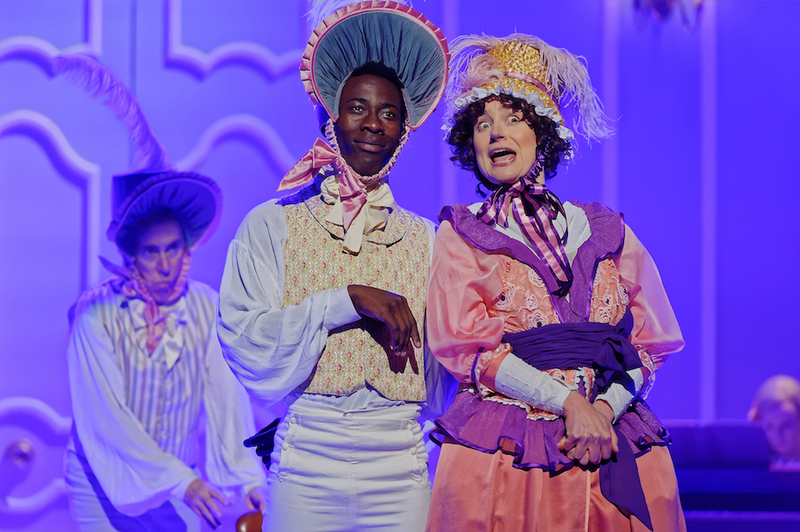 Designer Ailsa Paterson’s clever and frequent use of plumage (including a covetable chandelier) and other humorous props aid the solid performances, and there are numerous moments of brilliant and enormously enjoyable theatre. However, the pace of hilarity falls off in the second half, and the conclusion feels drawn out, rather than the jubilant happy ending we are all longing for. Kazoo, tricycle and ukulele meet Empire lines and melodrama in this relaxed reimagining of the buttoned up classic tale, with good humour, extra flounce and some unforgettable theatricality. Virginia Lloyd spent her youth at the piano, but drifted away in adulthood. Revisiting the instrument in her new memoir, she discusses women pianists, from her grandmother to the likes of Clara Schumann and the heroines of Jane Austen. Get your copy of Limelight Magazine's May 2018 edition featuring Leonard Bernstein, Birgit Nilsson, Thomas Hampson and Grace Clifford. A thought-provoking exploration of story-telling and the fragility of memory. John Doyle’s moving play of physics coming to terms with biology proves far less elusive than the Higgs Boson.